Trout let guard down in Lake O.
Hi there, I’m sure you are all watching the levels of the local rivers at the moment and making sure that you are available as soon as they become fishable or have some fresh fish in them. I would assume this week to be perfect in most rivers and especially the Tongarirowhich believe you me is due for more spawning runsÂ yet. Why do I think this? talking toÂ a local angler who prides himself on fishing the delta well, reported big numbers of fish showing up on the sounder arownd the drop offs to the Tongarrio river waiting for the urge to shoot over the lip-which they should have done. As you may have already read on TRM’sreport the river over the weekend was un fishble till Sunday and even then would have been pretty hard going so many anglers bit the bullet and fished Lake O the best they could. This isÂ a fragile fishery and cn be very hard to fish at times but every now nd then when conditions are right the fish let their guard down and anglers enjoy catching some of New Zealands hardest fighting fish. I was informed on Friday lunch time that the lake was perfect and the canal would be worth havingÂ a crack at so I dropped what I was doing and shot up to inspect and try and catch some of those special trout. The information was correct and it was not long before the indicator supporting two bead head nymphs took a turn south and we were hooked up to a fiesty Lake O trout. I managed 8 in the hour I was there and they all seemed to be slightly smaller than past years but still in awesome condition and well worth the hard work. 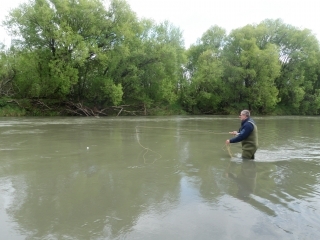 The area I like to fish is not easy casting andI must admit I did have an advantage over other anglers with a slightly longer cast which meant I could drift the nymphs down the edge of the weed bed without them getting caught up. Lots of anglers will shorten the leader to 6ft orÂ so to help with the casting but I tend to try and leave mine at 9ft and fish two bead head nymphs to make sure I’m fishing where the fish are. I always try and use a black nymph of some description as a huge part of the trout’s diet in this lake is black snails which cling to the edge of the weed or mooch about on the bottom. I managed to land an absolute beauty from the canal which gave me one hell of a good fight and weighed in at about 8lb. I release most fish from here and this big brown also was put back to try and get him up to trophy weight in a couple of seasons. Big fish like this have generally experienced anglers or being caught before and have some idea of getting away when hooked for the second time. When fishing from the bank you do not have the ease of pulling them away from the weed beds to avoid snagging and in fact you have to ease them over the weed bed to get them on the bank and this big brown did just that andÂ had me snagged for a couple of minutes. 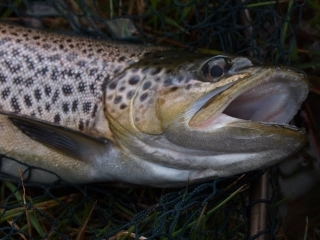 Many moons ago my old Dad explained and demonstrated just how to free up these willey trout while still having them attached to the leader and that is to simply give the fish slack and drop the rod taking all pressure of the fish. This sometimes would not work as the hook may fall out due to you taking the pressure of the hook but in most cases the fish will feel the freedom and swim out of the weed and free itself up again only to still be hooked as this one did for me. 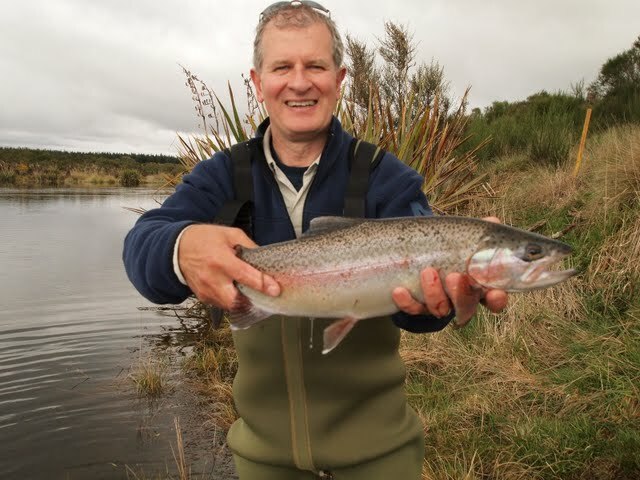 Saturday morning I was again guiding and thought the Tongariro may be worth fishing as it had dropped to 70 cumecs and should hold a good head of fresh fish which had moved in during the high water. We hit the braids at 7am and things looked ok with obviously high water but it was clearing with 2 or 3 inchesÂ of visibility and very fishable if you stay to the edges and fish bright glo bugs. We hooked up in the first few casts in spot x but fished for another hour with no luck at all which meant we were not doing it right or the fish had not travelled this high yet, backing my ability I assumed the fish were not there and we headed down to the bends down river. The river was much to high for this area and after a few throws we gave up and went to plan c which was to head to Lake O quickly and see if it was still fishing up there. On the way out of the Bends we netted a couple of trout which were caught in poolsÂ from the flood and not able to get to the river so that was our good thing done for the day as we released them back into the river. We had already fished and mucked about for 3 hours and as it wasÂ a half day booking we were obviously going to go well over time if we went to Lake O but we were getting on well and I hate taking clients home with no fish as my name is on the line so I forgot about watching the clock and pushed on up over the hill. 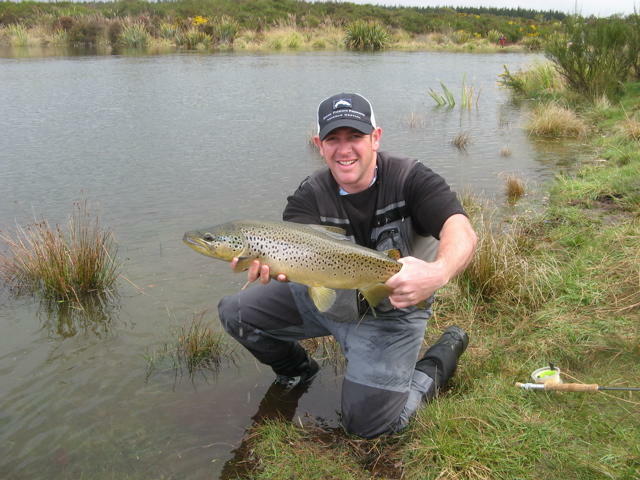 Upon getting to Lake O it was obvious that every angler which wanted to fish the Tongariro had been sent up here due to the conditions and it was hard to get my usual spot so we walked further down the canal to try our luck. The water had cleaned up which usually means less fish being caught andafter talking toÂ a few guys on the way down it was not looking good. Setting up with the same rig I had done well with the day before I was confident that we should find something mooching about which had come up the day before and not been caught yet. Andrew my client fired a nice long cast out to the middle of the canal which had an awesome drift on it with the indicator sitting high and drifting un disturbed, it just looked like it deserved a fish. Well bugger me it got one, indicator sunk underÂ a hard strike was applied and a loud splash echoed down the canal with a angry rainbow attached pulling line through Andrew’s fingers. Standing in still water conditions you can hear everything someone says and I heard some interesting comments come our way from anglers which had not done so well all morning, it made me smirk. Â We fished for about an hour longer and landed one more brown trout of about four pounds which took the nymph on the retrieve but things had gone alot quieter compared to the day before. This is a fantastic fishery with trophy fish in it and you can easily have double figure days here but you just have to hitÂ it right and change tacticsÂ to get the good fishing from the shore. 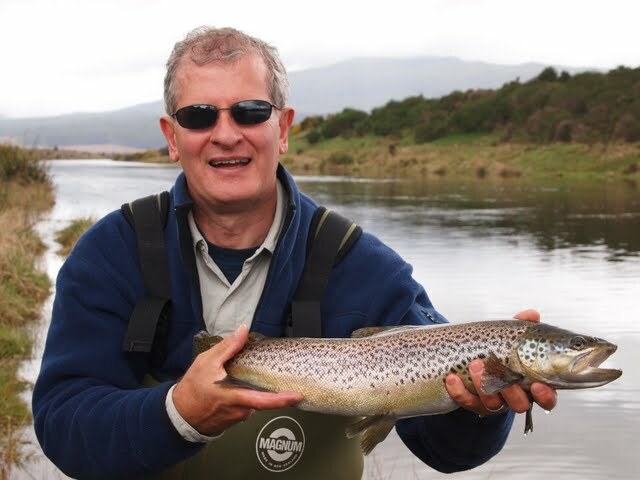 I would assume rivers will fish well again this week with the rain easing of and water conditions dropping so try and escape the office and give it one last chance to get some fresh winter fish to the smoker.